Florida Sun Car Rental started it's first car rental service in the Hawaiian Islands in 2002 under the name Aloha Rents. The business is wildly popular and continues to rent vehicles on the islands to travelers from all over the world. We have learned a lot from years of running a successful car rental business. One of reasons for opening the original service was a lack of customer service at many rental car services. We felt there could be many improvements, customer service being just one of them. That's where we began and all of us here continue to make strides in customer service and maintaining some of the lowest rates in the industry. We decided to launch a new business and use the knowledge we have acquired as a foundation. Over a year of planning has gone into the negotiations over rates, hiring employees and our colorful on-line presence. 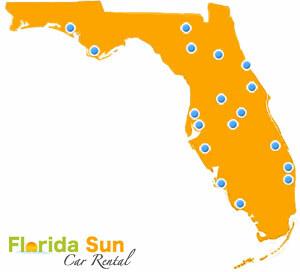 We have locations throughout Florida at airports and travel destinations. We like to hear where you found our rental car company. Maybe you read a review or did a search on Google, Yahoo or Bing. Let us know, we appreciate the feedback.